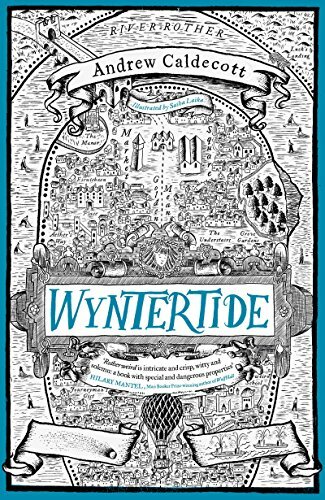 Wyntertide by Andrew Caldecott is the second book in the Rotherweird series and I would strongly advise reading the first one before this – there is much to understand. Rotherweird is an English town that is isolated from the country as a whole due to events in the 17th century in the main. The main characters from the previous books are augmented by a few new ones. The core of the story is that those who had opposed the people on the side of Wynter last time are worried that he is trying to return. Wynter’s fairly evil behaviour is the primary reason Rotherweird became the place it is. It is also the reason that any study of history is forbidden! The sheer bizarre weirdness of Rotherweird takes a little while to get back into. Remembering old friends and strange ideas. There are new facets not in the first book to be discovered. As Finch puts it “the talons of the past were clawing at the present”. Rather more is revealed about Rotherweird’s past in this story although I’m guessing there is more to come. While I enjoyed the first book I did have reservations about it. The same applies to Wyntertide. There is light and dark. There is humour and gravity. The balance between the two aspects is an issue to me. I really enjoyed the humour that Caldecott brings to the characters in both books. However, in this book, I found myself not getting the dread and tension all that well because of the humour – maybe it’s me. The sheer complexity of both these books is a factor too. Many years ago I started playing 3D noughts and crosses. Thinking in three dimensions can be quite challenging. However these books do seem to need at least that. Time and space are one thing however some characters are different over time for instance. My review of the first book in the series – Rotherweird – is here.